Restored and Preserved The Everedy Square & Shab Row district offers relaxing shopping experience in historic buildings spread over three blocks on East Street in downtown Historic Frederick, Maryland. 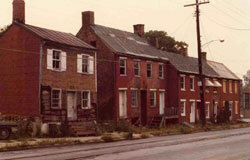 The dwellings which comprise shops on Shab Row formerly housed tinkers, wheelwrights and other artisans who serviced the first stagecoaches traveling west on The National Pike (now known as US Route 40). 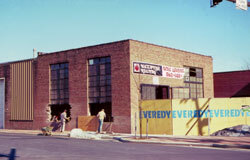 The buildings of Everedy Square were once the home of the Everedy Company, where the Everedy Bottle Capper was invented and manufactured. The product met with national success following the enactment of Prohibition. 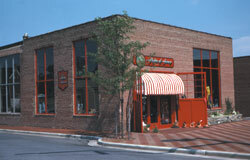 Prospering for 50 years, The Everedy Company ultimately produced a line of kitchenware that is still used in many households today. 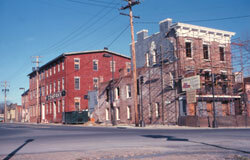 The declining area was purchased and restored by Frederick businessman, Bert Anderson, in the 1970s and 1980s to produce the vital shopping and business district that it is today. Formerly the Teflon Building, this large warehouse space was once the site where Teflon was applied to Everedy pots and pans. It now houses the 9,000 square foot gift shop, Flights of Fancy. Shab Row’s carefully restored buildings using salvaged original materials now house over a dozen specialty shops and services. 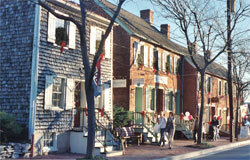 The earliest building in Everedy Square & Shab Row was once a vintage townhouse from the 1840’s. It now offers restaurant, retail and office space. 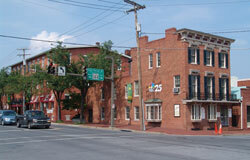 Everedy Square and Shab Row is a two-block neighborhood of more than 30 specialty shops, eateries and services located in historic downtown Frederick.